The DeviceMaster UP product allows multiple protocols on a single platform and makes upgrades for plant floor global visibility faster and more economical than ever before. The DeviceMaster UP industrial Ethernet gateway enables managers to leverage legacy devices and boost ROI, while reducing PLC programming and maintenance costs with simplified PLC interfaces. 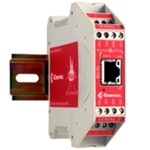 The DeviceMaster UP industrial Ethernet gateway is a cost-effective and proven industrial Ethernet connectivity solution.